We have a zucchini plant in our garden this year. 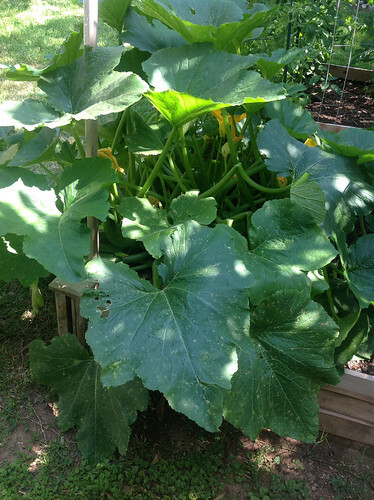 Just one, as we have learned from years past that zucchini quickly becomes overwhelming. Fried zucchini blossoms are one of our favorite summer treats, and one of the most cost-effective ways to get our hands on them is to plant our own zucchini plant. Apparently, though, there is something mysterious in our soil because that one zucchini plant has grown to monstrous proportions. It’s the tomacco of zucchini plants – each leaf is the size of a cocktail table. We are diligent about seeking out the zucchini and picking them when they’re either still flowers or at a reasonable size, and we’ve been eating a lot of zucchini fritters and zucchini bread this summer. However, occasionally one will escape our notice, hiding under a massive leaf, until one day we discover this Godzilla-zucchini, and have to figure out what to do with it. They’re more watery and less flavorful than the little ones, and the seeds are enormous, too. 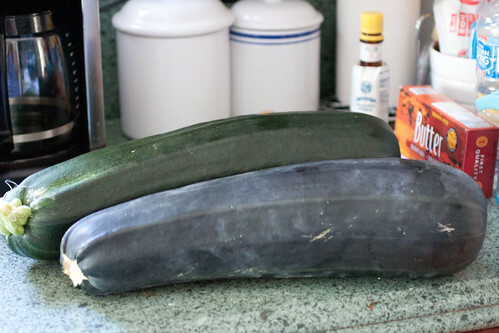 Staring at these enormous zucchini this weekend, I was struck with inspiration. What do you do with any excess vegetables? Make soup. 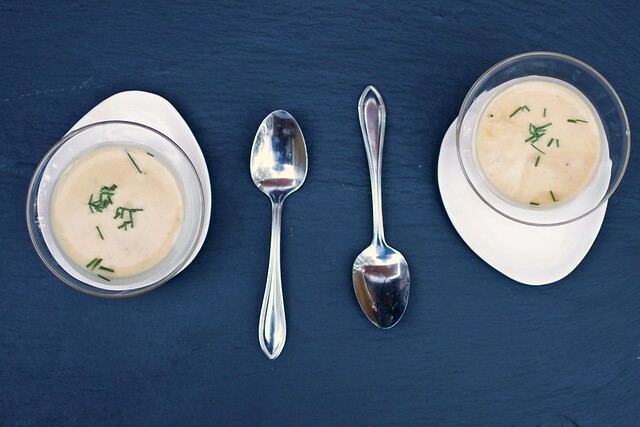 But since it is July, and it is going to be 101 degrees at my house tomorrow, chilled soup is the game. Since I wanted to reduce the water and concentrate the zucchini’s flavor, I decided to roast it before putting it into the soup. I cut the Godzillacchini into chunks, removed the seeds (very important in giant mutant zucchini – less so if you have normal ones), brushed it with olive oil, and roasted at 425 for 30 minutes. The zucchini emerged fragrant and caramelized. After this, it was simple to make a soup, using my tips for quick soups – some onion, spices, broth, and the zucchini. 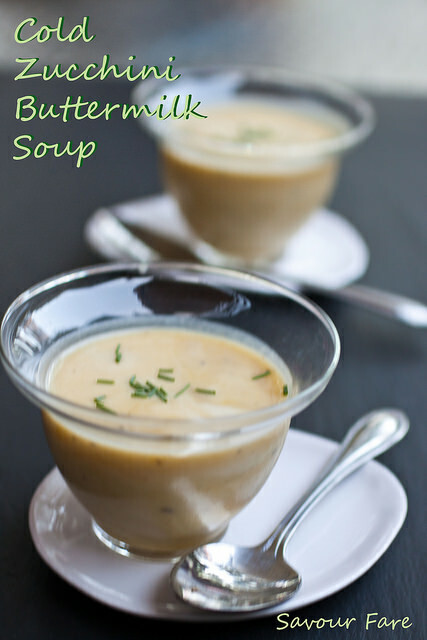 I blended to make it smooth, and, after it cooled, added buttermilk to thin the soup and to add a nice tang. If you don’t have buttermilk (we keep it around, because my kids are both buttermilk fiends) , plain yogurt will also do the trick. Cut zucchini in half lengthwise, and if using larger zucchini, remove the seeds and cut into chunks. Brush with olive oil, reserving 2 Tbsp. olive oil for the soup. Sprinkle with salt and pepper. 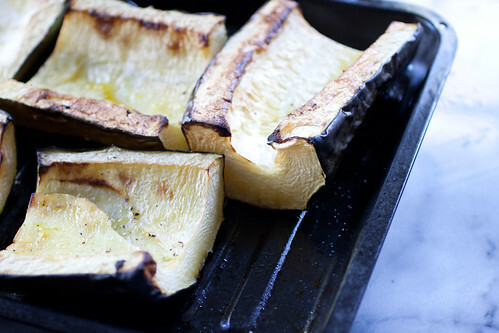 Roast zucchini for 25-30 minutes, or until tender and starting to brown. (smaller zucchini may take less time.) Let zucchini cool, then remove the skin (it should peel right off. If some pieces of skin are stubborn, don't worry about it. In a large pot, heat the remaining 2 Tbsp. olive oil and add the onion and garlic. Cook over medium heat, stirring frequently, until the onions are translucent. Add the spices, and cook for a minute more until the spices are fragrant. Add the chicken broth and zucchini, reduce heat to low, and simmer 25-30 minutes. Puree the soup in a blender or using an immersion blender, and chill. 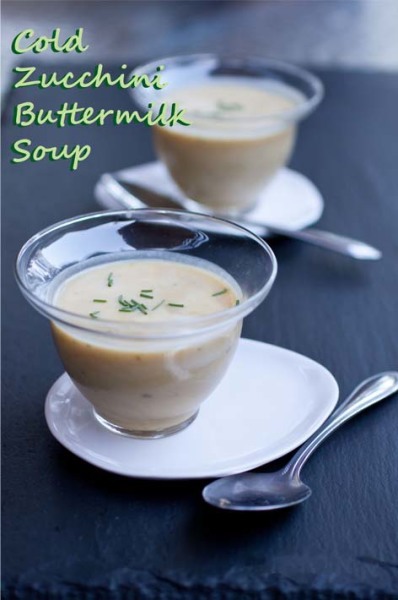 Once cold, add the buttermilk. Serve with herbs and/or croutons for garnish. BarbaraThis reminds me of viitsing my grandmother’s house on the weekends. If you aren’t a zucchini fan don’t be put off by the name only. This is absolutely delicious. You would never know that there was zucchini in this at all!